GP Toys H20 Aviax is one of the best mid-sized quad rotors I’ve flown, and considering that you can pick one up for less then $30, it’s an amazing deal for anyone. I’m usually not a fan of mid-sized quad rotors with brushed motors, but they seem to be all the rage these days. The craze really caught on with the advent of cheap MEMS gyros, smaller motors, smaller receivers and more powerful batteries. These new tiny gyros and receivers can fit on a small circuit board at a very low cost. Also, when you use smaller motors, you don’t need expensive speed controllers. All of these factors brought the cost and size of quad rotors down to a point where the average consumer can finally afford one. However, it’s hard to make a large quad rotor with a small motor. The solution seemed pretty simple – just gear the motor down – and the V222 quad was one of the first to use this technique, followed by the popular Syma X5C. The problem with gearing the motor down to make a larger aircraft is that you can end up with a lot of flight control issues if you don’t do it correctly. Programming the flight controller and selecting the proper gear ratios are all very important and GP Toys did an amazing job. Out of all the mid-sized quads I’ve tested, the Aviax H2O performedbetter than any of the others. I prefer a direct drive system over a geared system, but in this case, it actually works. I don’t want to forget to mention the one feature that makes this aircraft truly special – the fact that it’s waterproof. That’s right, I said waterproof. You can actually crash this aircraft into your pool and not worry about destroying it. A waterproof aircraft may sound strange, but you would be surprised how many times a puddle or a pool ends up beneath your aircraft when you crash. Now you can fly in almost any weather conditions and even crash into a lake and take off again. Another great feature is that it comes with 2 batteries, each one providing about 8 minutes of flight time. There was no camera included with the H2O Aviax, but there is a very standard camera connection that you can plug a camera into. The transmitter also has a button that will take pictures and start and stop video recordings, so adding a camera is easy. GP Toys said in an email that they are developing a waterproof camera for the Aviax, but they aren’t able to give a firm date for its completion. The range was great at well over 200 feet and the bright orange body is easy to see from far away. Despite the bright orange safety color of the canopy, the overall aircraft looks great. The solid outer shell looks very similar to a DJI phantom. The aircraft is smooth and sleek with a set of nonsymmetrical lines carved into the top of the canopy that reminds me of a prop from the movie Stargate. The lines are minimal, yet daring, and show a genuine desire to make the common canopy design look unique. Another feature that stands out is what looks like a small round antenna on the back of the aircraft. However, this round piece of plastic isn’t actually an antenna. From what I can tell, it’s just a taillight made to look like an antenna. It’s made from a partially transparent piece of plastic and there is a small LED at the base to illuminate it. Its main purpose is to differentiate the back of the aircraft from the front while you’re flying. It doesn’t hurt that it makes the aircraft look more advanced by sporting a round GPS-looking device on the back, even if it is just for show. There is also a set of vents carved into the plastic canopy, not for cooling, but to let water drain out. The H2O Aviax is made with a strong plastic shell, but the aircraft is not watertight. When you splash down, the aircraft will actually fill up with water, but the vents help the water drain out. The way the aircraft is waterproofed is the same way that your cell phone and other electronics are waterproofed. A hydrophobic chemical spray is applied to all the electronic components. It’s an amazing new process that’s been used on other quads before, but this is the first time it’s been added to such an affordable aircraft. This is a highly durable aircraft, not only because it can fly in the rain, but because it’s very well built. The plastic shell is extremely strong and able to withstand major impacts, the rotors are strong and flexible, and the gears and motors are all very resilient. All the spare parts are also available, ranging from the waterproof motors to the gears and shell. The aircraft came in an extremely small box for such a large aircraft. They removed the rotors and the legs to fit it in the package, so there is some assembly required. Each of the rotor shafts is temporarily held in place with a cotter pin that you need to remove. Then, you can slide the rotor on and put a screw through the rotor and the rotor shaft to hold it in place. It comes with a small screwdriver and a set of screws to attach the rotors and a set of screws to hold the optional rotor guards in place. The legs just slide into place without screws. I had a little trouble getting the screws through the rotors because the plastic was so tight, but I eventually got them all on. Other than 4 AA batteries in the transmitter, I didn’t need anything else to get into the air. The craft is preprogrammed and there is no port to reprogram the flight controller, so the stock settings are what you get. The manual provides a decent amount of information about getting started with the aircraft and warns that when you dive underwater, it may be hard to get out. It also says that you can dive underwater without damaging the motors or the main circuit board, but states that they don’t accept any responsibility or liability for damage to the battery. I guess that means that although they have waterproofed the batteries, if they get damaged due to water, they aren’t responsible. That being said, the battery compartment is not waterproof and does fill up with water, but the battery and the battery connection seemed to work just fine underwater. This aircraft flew great right out of the box, and I was very impressed with how smooth it flew and how well it banked and turned. The yaw rate is a little slow, but other than that, it performs great. I only had the chance to fly it in one rainstorm, but it did great, and didn’t react negatively in any way to the rain. I did fly it into a small swimming pool and let it sink, and then tried to take off again. It actually pulled itself back up to the surface and with a little fighting, it pulled itself free from the water and lifted back into the air. It was heavier due to the water that had filled the canopy, but it quickly drained out and flew fine. Shooting it with a water gun had no effect and even a water hose had trouble knocking it down. The craft has 4 flight modes, ranging from 20% power all the way to 100%, and you can turn the lights on and off with the transmitter. This aircraft is designed for any and all quad rotor pilots – newcomers and experts alike. 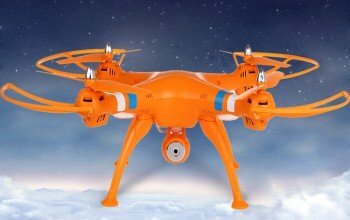 It’s easy to fly and very durable, but also very capable, with the ability to carry a small camera. It has a preprogrammed one-button flip that is very tight, smooth, and well programmed. It also has a headless mode and a return home mode, which work surprisingly well if you calibrate the gyro first. Calibrating the gyro is really easy. Simply land on a flat surface and move the transmitter sticks to the lower corners; the light will begin to blink, letting you know that it worked. The return home feature actually works better than expected. If you fly to the left for 20 feet and then hold down the return button, the aircraft will immediately fly 20 feet to the right. The aircraft actually tries to measure how far it has moved from the starting point by using the onboard gyro and accelerometer as a reference point. It works well enough to get the aircraft to come back roughly towards the direction from where it took off. Just remember that it helps to calibrate the gyro before trying the return home feature or the headless mode. The provided 2.4 GHz transmitter gets great range and has a few decent features. It shows you how much throttle you’re giving the aircraft, whether the lights are on or off, and the transmitter voltage. It also tells you what flight mode you’re in, but it doesn’t show the aircraft battery voltage. Overall, the transmitter is user-friendly and well designed. No included camera, but it does have a plug and a mount for a standard lightweight camera or FPV system. This is definitely a winner in my book, namely because of its low cost, good power, smooth flight, and waterproof quality. I usually don’t like mid-sized quad rotors with geared down brushless motors, but the H2O Aviax definitely got it right. If it were just an aircraft without the waterproof feature, it would be a great deal, but the fact that you can take it to the pool makes it an amazing deal that is definitely worth checking out. Just remember, if you do take it to the pool, although the aircraft may be waterproof, I’m pretty sure that the transmitter is not!